I’m sorry it’s taken me so long to post. There have been so many overwhelming emotions rolling around in my head that it’s been difficult to put them into slots, and more difficult to put them into words. So bear with me, this could be a long post, depending on where my head wonders..LOL…these days….you never know for sure! Last Friday was my last Chemo. Lots of posts were of Facebook, lots of picture, and even a video of ringing the bell, and and interview after with CP24. It was all kind of a blur, and I really needed some time to process it all, and I think I still am trying to do that. One thing for sure….I’m VERY happy to be finished chemo! Since everything was delayed, people were waiting for a long time, including my family. The one regret I have through the whole process is that things were kind of all crazy, nurses coming in and out, checking the flow, people were coming and going, and then my hands and feet were in ice to help protect my nails from the toxic chemicals. Through it all, I didn’t even realize that my family couldn’t find a place for themselves in my room, and felt like they couldn’t ask people to leave so that they could come in. I didn’t think, as there was a lot going on, that there was an issue, but for my kids, it was. I do regret not thinking of asking everyone for some private time with my family. But I only want to move forward, and we are doing that. 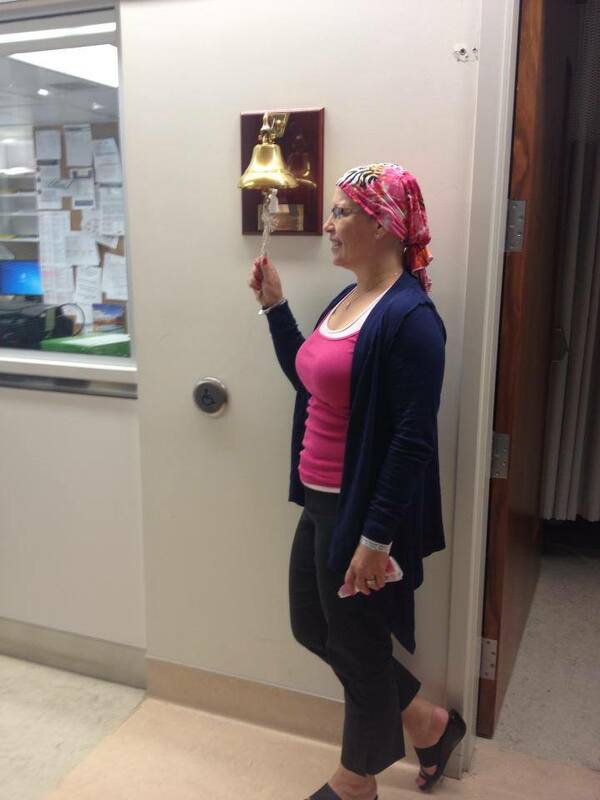 The bell ringing is an amazing ritual that symbolizes the end of chemo. You get to ring the bell in triumph! At PMCC because of the way the building is constructed, the atrium is open to the 5th floor, so when you ring the bell, literally everyone up to the 5th floor can hear it. I rang it long and hard!!! I was fortunate to have my family, many from the Foundation office, and some friends there. The Foundation filmed it for me, and it is something I know I will treasure. After the bell, the emotions flowed as I hugged Richard. I do remember saying, “we did it!, I never could have done this without you” and my girls. My amazing girls, they have been so strong, so amazing through all this. As positive as they have been, I can’t imagine what goes on through their heads as they watch their Mom go through all this. They have been there through the physical change of losing my hair, my eyelashes, and eyebrows. They’ve snuggled me when I was in my darkest moments. They really are my heros! After the bell ringing, we were taken to CP24 for an interview, then it back home for an very emotional ride. I didn’t have as many of the physical issues of feeling beat up this time, which I was grateful for. I have however been having a really tough time dealing with all the emotions that have now come forward. It’s difficult to put it all into words, and quite honestly, I’m not sure I can, as I’m still working through them. According to my friends who have been through this, it’s going to take a long while. Since my diagnosis and surgery and chemo, I have been in Survival mode, literally. You just try and get through each session, and wait for the next. I know I was lucky, I escaped death because of early detection. That might sound harsh, but that is the reality. People die from breast cancer. I have been fighting for my life!! I really didn’t have time to think of it in those terms till I had finished chemo. I know I’m hard on my self, I always have been. I’m finished chemo, I want to feel better…who wouldn’t?! I want things to go back to normal, I want my life back. Again, the reality is that it’s going to take a long time. I still have such little energy that I need to decide how to spend it. My head is foggy, and although Richard says that’s normal….hahaha…I have trouble concentrating and staying focused. I don’t seem to be able to find a place for myself, or find what makes me happy. I am so lucky to have some amazing friends, some of them survivors, some just so compassionate, that I’m beyond words on how important they are in my life. I’m lucky to have Richard who keeps me even. I know it’s hard for him. As most of you know, I have kept working through all this. Work has been very accommodating. But it’s hard, I have projects that need completing, and staying focused is difficult. Sometimes, I feel like I put out the fires or what needs to get done, and the pile underneath just keeps growing, and I don’t even know what there. Overwhelmed, and disoriented are probably good words to describe how I feel at work. These are strange emotions for me as I have been there 23 years! I have always been the “go to” person in my department, so this is hard for me. Yes, my expectations of myself are probably too high and unrealistic. I am only 9 days out of my last chemo!! I keep having to remind myself of that. I still have a lot of recovery to do from chemo. And I still have a long year ahead of me, and a few more decisions to be made. This is a busy week. I go for my BRCA test this week. This determines my next steps in terms of radiation, treatment or even more surgery. This week is also Rosh Hashana, the Jewish New Year. For my family, this symbolizes a new beginning. A beginning of health and happiness! I decided to have family over on Thursday for lunch to celebrate the New Year. You see I usually do a formal family sit down dinner, but this year, I didn’t think I would have the energy, so we decided on a buffet lunch instead….part of keeping the normal my family knows. This weekend is the Weekend to End Woman’s Cancers. This will be my 11th year walking, but this year will be different, as I will be wearing a pink lanyard symbolizing my survival!! I know I’ve touched on many thing in my blog today, and just surfaced many of the emotions rolling around my head. Sometimes, its hard because I really want to pour my heart out, but some of this in so personal and it’s hard to put into words. Finishing chemo is just part of the process, it’s the finite part. The emotions and dealing with the realities of it are far more difficult. But like I’ve tried to do every step along this is to take it one day at a time. One step at a time for sure….you are coping so well with all the treatments and all the side stuff ( interviews, appearances and such) which have all helped raise awareness and boost fundraising for Breast Cancer. I truly love how you have tried to honestly share your experience here. These words and thoughts will help many understand more what a patient goes through and they will be a better support because of it. Keep fighting my friend…keep well. Shana Tova to you and yours!! The support of your family is so essential. The fact that they can tell you they felt lost in the shuffle says what a good mom you are. They feel secure and loved enough to be able to express their emotions. Randy, I’m sorry the kids and Richard felt like they had to step aside. I wish they had said something. Had I known I would have gladly moved for them. Alas, what is done is done. So glad they did have some snuggle time with you before everyone else showed up. Also glad to have captures some of those moments for you in pictures. After next weekend things will slow down. No more spotlight and time for you to recoup, recover and rejuvenate!! Maybe a spa day for you and the girls would be a great idea. Or a weekend get-a-way for you and Richard.Hell do it all at the same time, go to St. Anne’s and have some down time with your loved ones!! You have earned it and you deserve it as do they! Its been difficult on everyone around you and I am sure everyone can’t wait to go back to how the Mellon family was pre-cancer. Is it possible?? I don’t know but I hope you can get there or maybe even a better place. Embrace and appreciate all those that love and appreciate you! Can’t wait to walk by your side in just a few more days!! I know, me to. I think it was all crazy, and it is what it is. It’s all ok, don’t worry. I love St. Annes!! I’m not sure it is possible to get to where we were before. We have to find our “new” place. That’s what I’m struggling with. I didn’t expect to feel so displaced. But I’ll keep doing what we’ve tried to do, one step at a time. This is a busy week, hopefully you’re right, once things calm down and the walk is over, I will be able to find my place. I do so appreciate everything and everyone that has been there through this journey, You have been there right from the start, and have certainly been through many “moments” with me, some good, some not so good.